Lock in a great price for HM Grand Central Hotel – rated 9.3 by recent guests! The hotel is literally perfect. I was upgraded to a better room for free (maybe because hotel is half-empty so far). Staff is very friendly and always checking on you because they do care. Everything is a brand new there. Wi-Fi works great. I really like a coconut smell of towels! There are total of 82 TV-channels. Breakfast is really good and delicious - the most important and good thing is that breakfast starts early - at 6:00 AM. 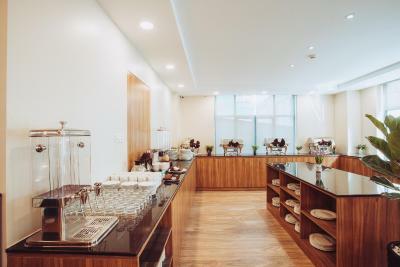 The staff is among the best I've encountered in Asia - super friendly and helpful! Spacious rooms Clean and comfortable bathroom Nice and cold rooftop pool Excellent location Ping Pong table is nice! Beautiful and clean hotel with very friendly staff. Excellent free steam room, hot tubs and pool. The room is large, the bathroom and shower are nice and clean, and the bed was very comfortable. The breakfast is included and was also good. I highly recommend this hotel, especially for the price. I stayed here for 2 nights during Khmer New Year. The facilities are of a very high standard. Comfortable bed with quality bedding, strong shower, air-conditioning worked well. Everything is kept clean. Staff were lovely and very helpful. The rooftop pool is great and I used the sauna also. Would stay here again. Very clean property. Staff is very nice and efficient. Great breakfast. Very nice rooms at a great price. Staff friendly and helpful. Breakfast was above average for Asia. The spa area was very relaxing. Rooms very clean and cosy. 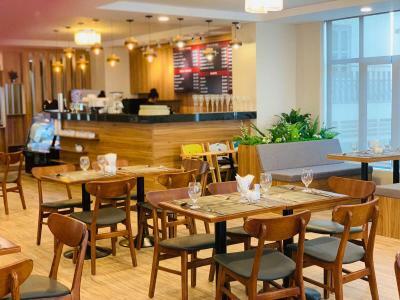 HM Grand Central Hotel This rating is a reflection of how the property compares to the industry standard when it comes to price, facilities and services available. It's based on a self-evaluation by the property. Use this rating to help choose your stay! 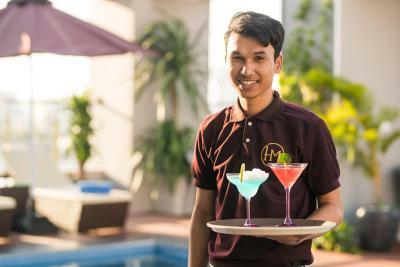 One of our top picks in Phnom Penh – and a guest favorite. 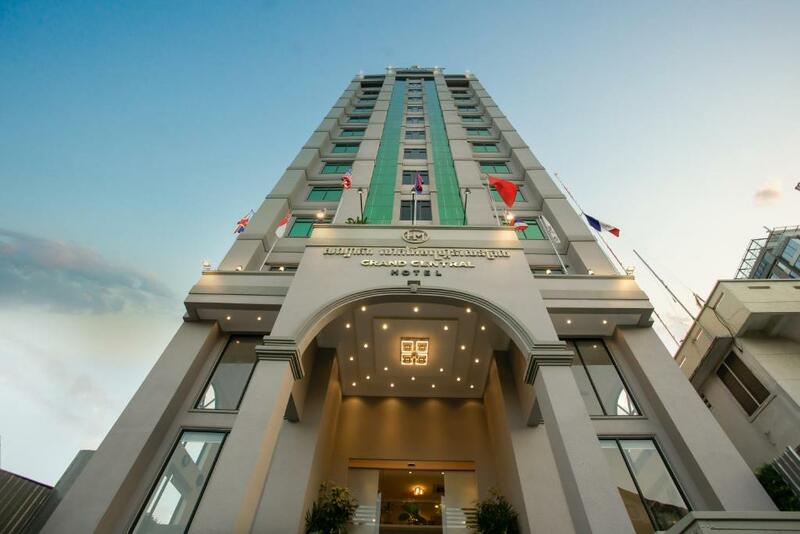 Featuring an outdoor swimming pool, HM Grand Central Hotel is located in Phnom Penh and is a 9-minute walk from Royal Palace Phnom Penh. 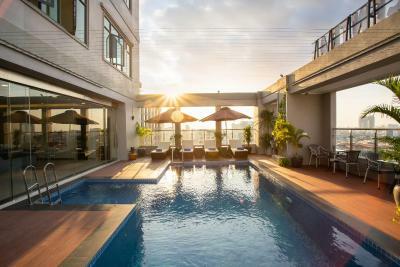 The property is close to several well-known attractions, one mile from Chaktomouk Hall, 1.1 miles from Sisowath Quay and 1.2 miles from Vattanac Capital. The property has a hot tub, restaurant and shared lounge, and Riverfront Park is 1.2 miles away. Guest rooms come with a flat-screen TV with satellite channels, a coffee machine, a shower, free toiletries and a desk. All rooms are equipped with a private bathroom. All guest rooms at the hotel are equipped with a seating area. HM Grand Central Hotel has a sun terrace. You can play ping pong at the accommodation. Guests can work out in the gym and a business center is available. 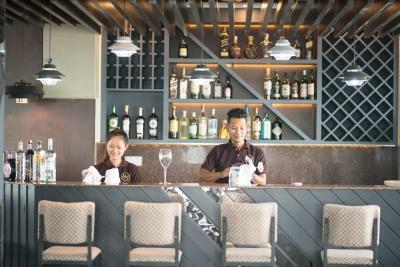 Speaking English, French, Khmer and Thai at the 24-hour front desk, staff are willing to help at any time of the day. Tuol Sleng Genocide Museum is 1.3 miles from HM Grand Central Hotel. Pochentong Airport is 7 miles from the property. When would you like to stay at HM Grand Central Hotel? This suite features a balcony, tea/coffee maker and seating area. This double room has a tile/marble floor, seating area and mini-bar. This twin room features a dining area, mini-bar and kitchenette. This family room has a bathrobe, mini-bar and dining area. This suite features a dining area, tile/marble floor and seating area. Hotel surroundings – This neighborhood is a great choice for travelers interested in temples, museums and local food – Check location Great location - show map Guests loved walking around the neighborhood! House Rules HM Grand Central Hotel takes special requests – add in the next step! HM Grand Central Hotel accepts these cards and reserves the right to temporarily hold an amount prior to arrival. Thought it was central. I think it's riverside now. Brekkie eggs was a bit oily. Coffee could have been better. Pool was 1.6m , too deep for my partner to swim in. Breakfast was disappointing. A lot of stir fried and greasy foods. They only had white bread (brown or wholemeal or wholegrain bread would have been appreciated). Pastries were on the stale side. Another gripe for me was the windows left wide open in hallways. The reception,/lift are air-conditioned so it was always a blast of heat walking from the elevator to the room. Amazing staff, amazing room, amazing breakfast. Friendly staff, helpful and pleasant, neatness is excellent, quality matresses, lovely pool area. room service was fasr and good. The staff were absolutely amazing. The most helpful and kind I have come across. There was always a tuk tuk outside and the hotel had a sign up stating average rates to different destinations. The staff even looked after my children while I visited S21. Fantastic staff and hotel, will definitely stay again. Some people might prefer a location a little closer to the riverside. It is a good 15-20 minute walk, but in the heat and humidity feels longer. The restaurant does lack atmosphere for a relaxing/romantic/cosy evening meal. I would suggest dimming the lights and changing the configuration of the furniture. The prices in the restaurant and bar are quite high when compared with those one can get at the numerous riverside restaurants and bars. I would have eaten here once at least if the prices had been lower and the atmosphere better. Love the rooftop/swimming pool area for a drink though. When I was their the saunas were not working, however in Phnom Penh one only needs to step outside and you receive an instant sauna. The hotel is very clean and the rooftop swimming pool/bar was super nice. 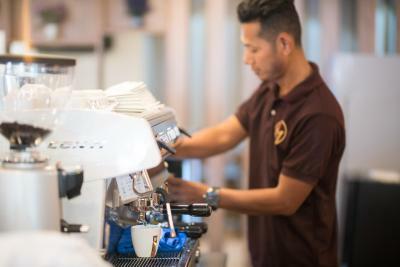 The staff are always so friendly, helpful and polite. They are always smiling. My room was comfortable, with a great ensuite shower with excellent water pressure. The air-co worked really well and was easy to use. Lots of channels on the TV and good storage space in the bedroom. This hotel felt very safe and secure. The included breakfast was very good in terms of both quality and variety. Super clean comfy room. Staff so helpful, couldn’t fault them. Breakfast really good. Pool and gym a bonus. Hotel should consider providing free airport shuttle service. Friendly staff who went out of their way to make our stay comfortable. We couldn't believe the hotel was 3-6 months old, very well organized and managed. Can’t say it was something we didn’t like as there was a tour desk and reception were always ready with info - however some tourist information (rather than chess magazines!) in the room would be a nice touch. 😀pillows and breakfast lovely. Room spotless. Very very helpful staff! Really nice pool and jacuzzi.